A retail worthy selection of sweets branded with your name, our promotional Haribo Sweets contain actual Haribo’s to give out, so you know they are going to taste good! Having been around for almost 100 years, and being a market leader in jelly sweets, personalised Haribo sweets are a great way of making sure your customers receive high quality sweets. Not only are these customised products great handouts for events but they are also ideal for small gifts and thank you’s to clients. 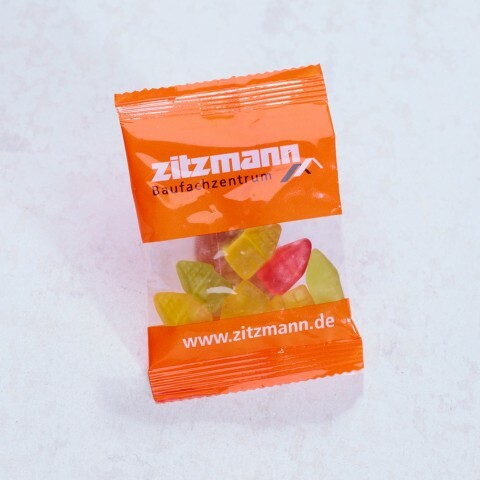 Our range of branded Haribo includes carefully selected products that are sure to be a hit with your clients and provide optimum branding potential. Supplied with 10g of shapes of your choice, the branded Haribo Jelly Shapes is one of our favourites from this category. 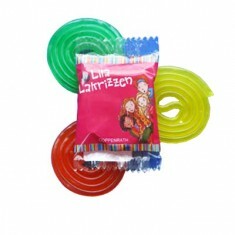 The huge branding potential and premium quality of sweets is sure to go down a treat with everyone who receives one of these bags with your name on it. Alternatively, twist things up with our Haribo Fruit Swirl that comes with a personalised packet that again has outstanding branding area for you to print your design. Available in four different flavour, all with a colour reflective of the flavour, these swirls are a treat for anyone who is looking to satisfy their sweet tooth. Dreaming of what your design will look like? Dream no more! Give our sales team a call today and we can arrange free of charge visuals for you. Treat yourself with a tasty Haribo Fruit Swirl! With a cus..
Hand out our personalised 10g bag of fruit Haribo Jelly Te..